A good track pant is a must-have clothing item for any comfort loving woman’s wardrobe. 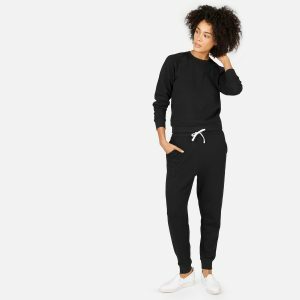 Luckily these days most women’s sweats are not only comfortable but can be flattering and even stylish. The key to finding a comfortable sweatpant is the fit and the softness of the fabric. Whether you like your sweatpants big and baggy or a little more tailored, there are a lot of great options available. We have found some of the most popular styles. 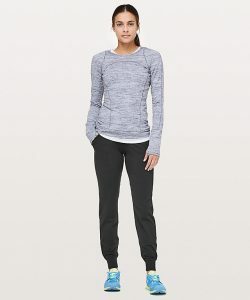 The Lululemon Ready To Rulu Pant 29″ is a popular, soft jogger that is a favorite of a lot of women. It uses the breathable Rulu™ fabric that is fantastic for sweat-wicking, as well for comfort. The Ready to Rulu have a bit of Lycra added to the material that gives it some stretch, so they work well for working out or for just lounging. Depending on the sizing you go for, they are reasonably fitted for a jogger style if you want a looser feel you may want to consider sizing up. One other thing to note about this style is that it is high-rise to give you a little bit of extra coverage if you are moving around. Overall the Ready to Rulu is a versatile, generally flattering design that will work well for most body types if you like a tight fit. 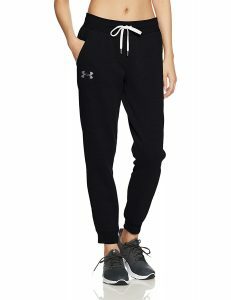 Under Armour makes a lot of really comfortable activewear that works well for all kinds of activities. Their Favorite Fleece Pant is a great option if you want a comfy pant that is a flattering skinny fit. They are a jogger style, so they fit a little short in the ankle. Like most Under Armour garments, they are high quality and will hold up to whatever you can put them through. The fabric is pretty thick, so this is an excellent option for colder weather. 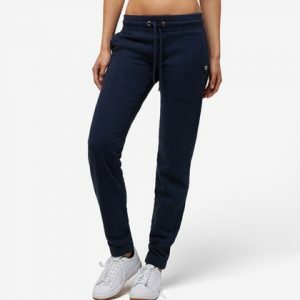 Gap sweatpants are usually a tailored, flattering fit for most women, they often come in a range of colors, and the thickness of the material varies according to the season that it is sold. The Gap Softspun Joggers are very popular and can easily be worn out and about since they look more stylish than sloppy. Champion offers a great selection of sweat pant options, with all different kinds of fits and fabrics available. Champion’s sweats are inexpensive and pretty good quality for what you are paying. They also have some plus size styles. Some of their most popular styles are the Champion Authentic Women’s Jersey Pants and the Champion Women’s French Terry Jogger Pants. If you love a thick baggy sweat pant, you may also want to check out some of the men’s styles that Champion sell. They are often a little bit thicker, and many have pockets, which are sometimes hard to find on women’s styles. 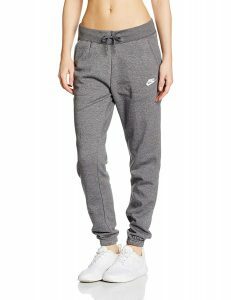 For those who prefer a more sporty design, the Nike Sportswear Tech Fleece Women’s Pants are a trendy style that is known for comfort. The fabric is a breathable, cotton polyester blend that is pretty lightweight, yet it still manages to keep you warm. The fit is tapered, and a lot of women find it very flattering, be aware that the material does loosen up a bit as you wear them. They are on the expensive side for a pant, but a lot of people find their quality and feel to be worth it. If you like a less form fitted, yet straight leg pant that you can wear out of the house, these pants from L.L Bean are an excellent choice. They are a soft, french terry material with a comfortable modern fit. They also have pockets (both side and back pockets), which can be hard to find in a woman’s sweat pant. Women love them because they are well made, fit well on most body types and are well constructed. The waistband is quite broad and has ties that you can adjust for the right fit. The fabric is a little bit lighter, so these pants are best for milder weather and not cold weather. They come in a range of colors that change slightly from year to year. 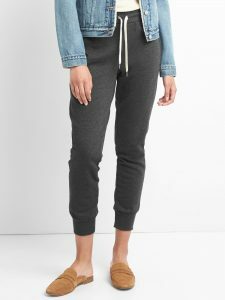 The Aerie Plush Jogger are very soft and make a fantastic lounge pant. Lots of women love to wear these to bed, but you can comfortably wear them outside the house without feeling self-conscious. 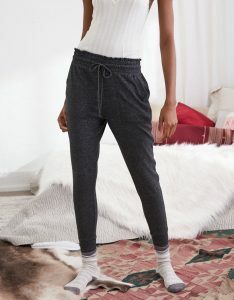 The Aerie line of joggers come in lots of different colors in a few slightly different styles, including one that has a little zipper at the ankle. They have deep front pockets and a wide, comfortable waistband with a drawstring. Alternative Apparel has quite a few comfy pant options, with one of their most famous being the Eco-Fleece Jogger. This jogger has a tapered leg and drawstring waistband. It is made from 50% Polyester, 46% Cotton, and 4% Rayon, some of which is organic and recycled. They are low rise and are slim in the hip and the thigh, but they look very chic and are comfortable. 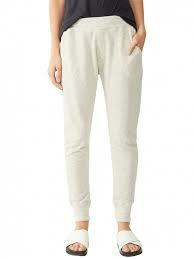 Since they are the jogger style, they look good enough that they can easily pass as a regular pant. American Giant makes some pretty thick and warm sweatpants. Their Classic Sweatpant comes in a wide array of subtle, muted colors and they are a relatively slim fit. They have a few different cuts and styles of pant to choose from. They are not cheap, but they are made in the USA are generally regarded as pretty high quality. They are also very durable since they use different techniques like a “cover stitch” for reinforcement and high-quality cotton. The type of fabric that is used may feel a little stiff at first but will soften quickly with wash and wear. This price is a little higher than you may usually pay, but it is tough to buy something made in the U.S that will last a long time without having to spend a little more than your average garment. Roots make some of the coziest sweats around. Most of the Roots styles are made from soft fleece that feels super comfy and very thick, so they are perfect for fall or winter in colder climates. One of their most popular styles is the slim sweatpant (pictured). Even though they are slim-fit, they are a little bit baggy through the hips and the thigh, and then slim through the leg, so they look tailored. Some of the colors that Roots offer are also a little different. One of their most popular colors is the ‘salt and pepper,’ it is grey with a little bit of black mixed in. They are a bit pricey for an at home pant, but if you can get them on sale, they are well worth it and should last for a long time. On the hunt for the world's most comfortable things. Comfort Nerd is a participant in the Amazon Services LLC Associates Program, an affiliate advertising program designed to provide a means for sites to earn advertising fees by advertising and linking to amazon.com. Comfort Nerd Copyright © 2019.